Dr. NTR UHS has issued notification for the first and final verification of original certificates for Web Based Counseling will be conducted for Admissions into New B.Sc., Paramedical Courses in the Colleges under Dr. NTR UHS, Vijayawada. The candidates applied for admission into New B.Sc., Paramedical courses for the year 2018-19 are hereby informed that applied list is available in the University Website http://newparamed.apntruhs.in and http://ntruhs.ap.nic.in on 06.12.2018 and 07-12-2018 All qualified and eligible candidates are informed to attend Web Counseling i.e verification of original certificates for admission into New B.Sc., Paramedical courses for the academic year 2018-19 as per the schedule given below at the following Help Line center. Original Certificates to be produced at the time of verification of original certificates : The candidates are directed to bring all the original certificates (mentioned below) and two sets of Xerox copies. 5. Study certificates from 6th Class to Intermediate. A candidate who has not studied in the any school, a residency certificate for that period only shall be submitted. 9. The candidates claiming fee exemption shall produce the latest Income certificate of the Parent issued by MRO / Tahsildar. 1. The candidate should have completed 17 years of age as on 31-12-2018. The candidates who do not complete 17 years as on 31-12-2018 need not attend the counseling. The candidates born on or after 01-01-2002 are not eligible not eligible not eligible for admission into the above Courses. 3. Candidates please note that this is the first and final phase of verification of original certificates. No further phase of verification of certificates. No further phase of verification of ification of original original original certificates will be done. certificates will be done. 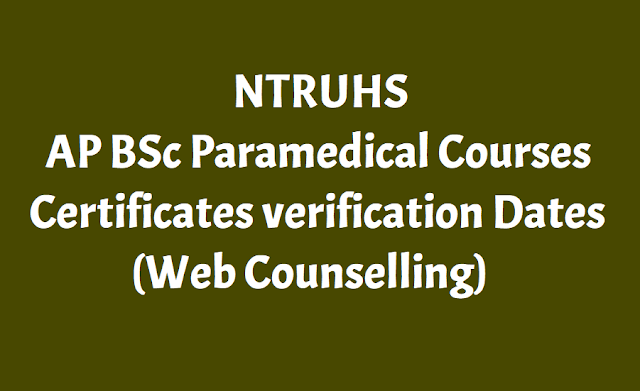 Candidates who got verified their original certificates can only exercise their web options in the subsequent phases if any. 4. The students belonging to SC/ST/BC/EBC/Disabled/Minority categories will be considered for reimbursement of Tuition Fee to the students is subject to verification and eligibility criteria prescribed by the State Governments of Andhra Pradesh. 5. Tuition fee as prescribed by the Government of Andhra Pradesh.